There are pros and cons to both 5-sided machining and 5-axis machining. To understand machine configurations, it’s important to understand the basic terminology of 5-axis machining centers. If you think in terms of a 3-axis machining center, it has an X-axis, Y-axis, and Z-axis. With a 5-axis machining center, the additional rotary axes will rotate about two of those three primary axes. 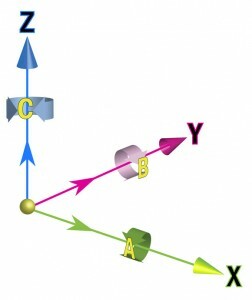 The axis that rotates about or under the Z-axis is called the C-axis. The axis that rotates about the Y-axis is called the B-axis. The axis that rotates about the X-axis is called the A-axis.